See that bulge? Yeah, I meant to do that. And aren't the pink and green yarn bell solutions fantastic? My Tupperware collection truly is the gift that keeps on giving, though I wish I had another in the pink one's size. I think it came in a set and I gave all the others away with meringues in them one Christmas. I take comfort in the fact that in addition to the advantages of depth and stackability and minimal weight - I've been carting them all over in a flat-bottomed bag and knitting while standing around with no trouble at all - I'm not wedded to them. When I want to work on the Adventure Sweater instead, I can lift these balls out and slip in the other balls without rethreading a thing. But back to the bulge. It's for the thumb joint and hopefully not unnecessary. 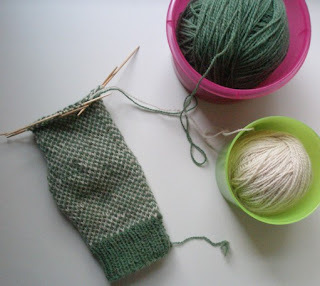 I stumbled across a pattern for a mitten knit in a tube with a thumb opening I wanted to try, but salt and pepper stitch is so rigid I was afraid the gap you use for it simply wouldn't be enough to permit circulation. I won't know whether I was right until I do the thumb, but I'm enjoying the knitting so much I don't really care if I have to rip back to redo. The bulge isn't the only reason I might have to do that. Let's take a closer look at the thumb opening, shall we? 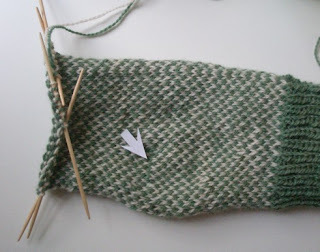 The salt and pepper is so tight you can barely make it out even with the arrow, but I've got 8 stitches knit with 'waste yarn' (aka the bit of yarn used to tie the skein.) When I'm done the top, I can go back and tug out said yarn, leaving live stitches at the top and bottom of the gap to slip onto needles along with another 4 or so I pick up along the sides. If it works, and if it does turn out that I put it in exactly the right place, this will be the simplest mitten I will ever make. And if it doesn't, I will be frogging. Ribbit. Waste stitches work perfectly, though I usually use a very brightly contrasting yarn because I distract easily, and if the waste yarn looks like the rest of the piece, I will end up trying to remove the wrong hunk. I am stupid that way. Your mitten looks great!